Written by Colleen Sedgwick on April 14, 2014 . Posted in Clients. Before we start, I want to make something very clear… If you are looking to scale your business, you need to adopt a certain type of mindset. Once you make this shift in consciousness you are going to jump to the next level of success quickly. Learning this one piece of valuable information, completely changed the way I thought about my business and about my customers. So, what is the lifetime value of a customer? In short, it is the projected revenue that a customer will spend during their time with your business. A very simple math equation that you can use to figure this out is to divide your lifetime gross revenue by the # of lifetime revenue-generating customers. NOTE: This is the most basic way to figure this out. You can most definitely calculate a more targeted number by doing some more advanced math, but if at the very least you figure this equation, you will have a basic understanding of this concept. When I did this math, I was astounded at how high that number was. Now I don’t feel badly about offering discounts or running promotions to pull-in new clients. MISTAKE #2. Not having your company’s Unique Selling Propositions clearly defined. What are Unique Selling Propositions? They are what set you apart from your competition. It is crucial that you spell out what makes you different, so that your business becomes the only clear choice. There are tons of pet sitting businesses out there all saying the same exact things. Get clear on your USP’s and you will shine in comparison. I named Pet Nanny’s USP’s The Pet Nanny Peace of Mind Blueprint. Take a look. You’ll see that I have clearly listed and explained how Pet Nanny is unique. Until you do this, your company will be like any old vanilla pet sitting service out there. MISTAKE #3. Not setting goals and mapping out a plan to achieve them. Here is a simple method for you. Let’s say you want to make $75,000 next year. This is your annual goal. Divide this # by 12 and you will get a monthly goal of $6,250.00. Next, figure out how many clients you need or how many visits or overnights need to happen for you to achieve this. 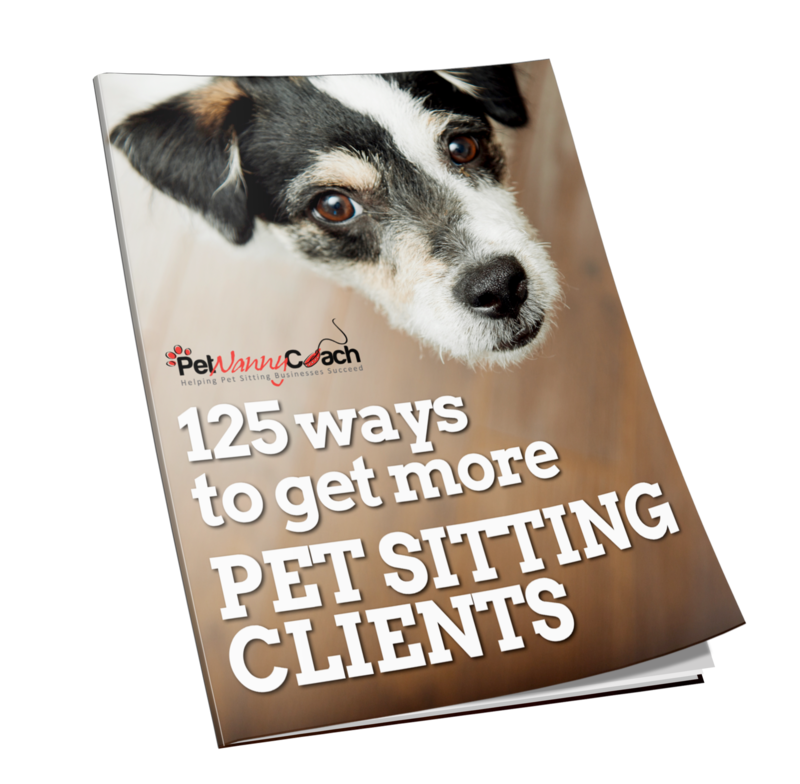 $3,190 is the leftover amount that you would need to generate with your pet sitting visits, house sitting assignments and any other extra services you offer. You could also aim to bring on more monthly customers and hire another walker to help with the walking. This is where you need to execute your marketing power wheel. Each section of the wheel will help you reel in new, ideal customers. Map out on a calendar exactly what you will do every week/month to bring in new leads. Include social media, blogging, article submissions, networking groups, stay-in-touch marketing, direct mail, referral partners, strategic alliances, promotional campaigns, video trainings, giveaways etc. Once you get clear on what marketing needs to happen, you simply plug it into your calendar and it’s done with for the year. You just need to follow the calendar. The key is to do it systematically and automate as much as you can. If you do this, you will always have plenty of clients. Remember to track your goals every week. What you track, grows! Your Homework Assignment: You have a lot to do this week. Figure out the Average Lifetime Value of Your Customer. Write down your Unique Selling Proposition. Get clear in your numbers. Set an annual goal and monthly goals and then map out a strategy to achieve them.